Ladder racks make it easy for you to haul and carry materials without damaging your truck or van. 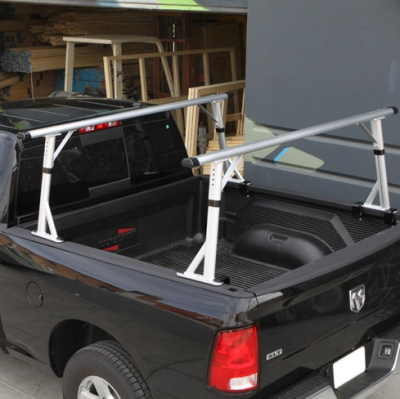 If you need extra space in your truck or van grab a set of ladder racks. Plus, most racks bolt directly to your vehicle making them very secure for whatever you haul. 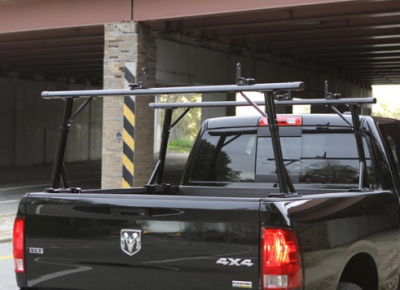 Ladder racks make it easy to carry ladders, cargo and other accessories on the top of your van or truck. For lightweight aluminum truck racks check out the TracRac G2 and TracOne by TracRac. This truck rack attach directly to your bed using damage free installation and mounting clamps. If your looking for a rack to use with your camper shell check out Hauler Racks Camper Shell Racks. Like van racks, these racks make carrying cargo on top of your work truck extra easy; especially bulky ladders, steel piping and lumber. Ladder racks are almost essential for work Vans. Vantech Racks are available in 1 bar to 4 bar systems and easily mount to your gutter mounts using drip well clamps. Whatever you need, Mudflaps.com can guarantee you won't be disappointed by our selection of racks. If the weight of your ladder rack is an issue check out TracRac. TracRac ladder racks are high quality, light weight racks that easily mount to virtually any truck! Ladder racks available now for the best online prices. Order online or call 1-720-242-7322 for more information!